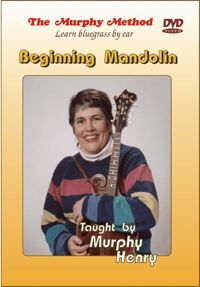 Beginning Mandolin: Doesn’t the mandolin look like it would be fun to play? So small, so light, so easy to carry around. It can be played softly and tenderly or it can speak loudly and add fire to the bluegrass sound. No matter which direction you want to take, we can help get you started. And we make it as easy as possible by using simple songs to get you picking right away. We also go over the chords (easy formations) for each song so you can play along in a jam session (even if you don’t quite have your solos worked out yet). If you’ve been wanting to play mandolin, now is the time to jump in. Just do it! No Tab.